100+ features. 0 learning curve. 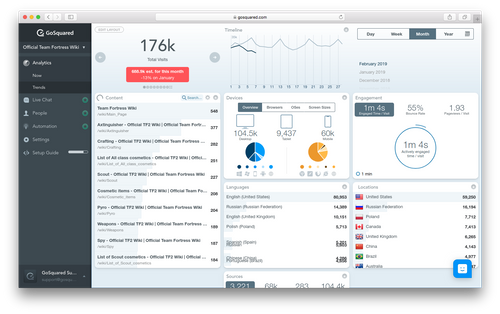 GoSquared Analytics gives you all the features you need to understand and improve your website, with none of the complexity you find in other tools. The world's most accurate measure of how many people are currently on your website. Industry-leading visitor engagement metrics to understand how people are reading and using your website. See how the number of concurrent visitors is changing throughout the day or week, and compare it to a previous timeframe. Instantly discover the websites, search engines, and social channels driving visitors to your website right now. A beautiful display of the location of each of your visitors in real-time, including a daylight line that adapts throughout the day. See the content that's performing best based on the number of visitors currently engaged with each of your top pages. See a real-time stream of Tweets in GoSquared Analytics to understand how activity on Twitter may be driving attention towards your website. Discover how much of your audience is on a mobile, tablet, or desktop device right now. Instantly receive a notification via email and other tools such as Slack when your website is receiving abnormally high levels of traffic. When your website has a drop in traffic, GoSquared can notify you to spot potential downtime and other problems early. Using industry standard campaign URL parameters, GoSquared Analytics shows you how each of your campaigns are performing in real-time. GoSquared Analytics shows you when visitors are referred from a specific Tweet, so you can reach out and engage in the moment. Go beyond the pageviews to see a list of individual visitors currently on your website. View the browsing session for any visitor currently browsing to understand more about how they navigate your website. 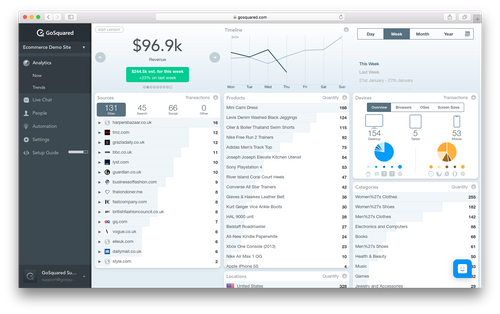 GoSquared Analytics can look up the IP address of your visitors to give you extra information about the organisations they may be browsing from. See the languages in use by the visitors currently on your website. Understand more about your website visitors with a breakdown of the browsers they're using to view your website. See the operating systems in use by visitors currently on your website. Based on the powerful engagement metrics in GoSquared Analytics, see how many of the people currently on your website are actively engaged. Annotate key moments to remind your team why a traffic spike occurred – such as when a blog post goes live, or someone influential mentions you online. Our robust, elegant, and well documented Analytics API enables you to make use of GoSquared Analytics in your own tools and projects. See your web analytics information on any device – from your mobile phone to your big screen TV. GoSquared Analytics looks beautiful across all your devices. When you can see the visitors currently on your website, you naturally want to reach out to chat with them. That's why GoSquared Analytics integrates seamlessly with Live Chat. We work tirelessly to ensure GoSquared Analytics respects the privacy of your visitors, and we've been independently accredited as GDPR compliant. Prevent the collection of personally identifiable information from your visitors. We believe the best web analytics service should be easy-to-use and helpful for businesses, and respect the privacy of visitors. No waiting. No nasties. No training needed. Free for small sites. No credit card required. Easy setup. Your most important web analytics metrics are always on hand in GoSquared Analytics, and they're always up to date. No waiting – ever. One number is good. Two numbers are better. GoSquared Analytics automatically compares your current timeframe against previous timeframes to help you understand if you're on track for a good month. Web analytics that gets smarter the more you use it. Smart Predictions intelligently estimate your daily, weekly, and monthly traffic levels based on historical data. No clunky timeframe selection around here. Switch between the current day, week, or month in a single click with GoSquared Analytics. See how engaging your content is and if you're driving visitors to spend more time on your site. Instantly see the top pages on your website for any given timeframe to understand which content is performing best. When you implement GoSquared's powerful event tracking, you'll see the most commonly triggered events across your audience. Discover how much of your audience has been browsing on a mobile, tablet, or desktop device. Most tools calculate bounce rate based on out-of-date philosophies. GoSquared Analytics gives a more accurate idea of bounce rate based on our powerful engagement metrics. Beautiful, easy-to-read email reports on your website performance delivered to your inbox every morning. They're also available on a weekly and monthly basis too. See the languages in use by the visitors who have been to your website in any given timeframe. Your data isn't trapped in GoSquared Analytics – you can export any metric with a single click to a CSV file for further exploration. Group your top pages by the first level path of the URL to see which sections of your website performed best in a given timeframe. GoSquared Analytics integrates with hundreds of tools – including the ones you already use. Trigger workflows in Zapier (and the 1,000+ apps Zapier integrates with) based on real-time traffic alerts in GoSquared Analytics. Notify your team about traffic spikes and drops, and send daily, weekly, and monthly reports into Slack with our Slack integration. Connect your Twitter account to GoSquared to see a real-time stream of Tweets in your GoSquared Analytics Now dashboard, and expand "t.co" links for easy reference. 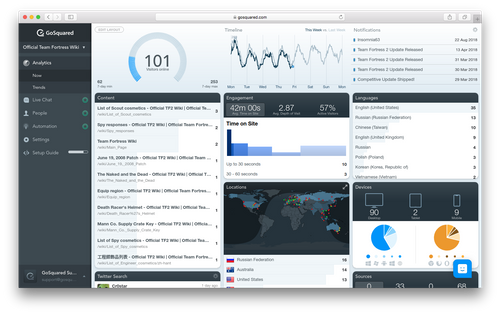 Trigger actions in your own tools based on real-time traffic alerts in GoSquared Analytics. Enable GoSquared Analytics on your Wordpress blog with the GoSquared Wordpress plugin. See who's on your Shopify store, and gain powerful web analytics by integrating GoSquared with your Shopify store. Add GoSquared Analytics to your website without touching a line of code with Google Tag Manager. Add GoSquared Analytics to your website without touching a line of code with the GoSquared Segment integration. Gain a deeper understanding of your Squarespace website by installing GoSquared Analytics. Gain a deeper understanding of your Joomla website by installing GoSquared Analytics. Gain a deeper understanding of your Drupal website by installing GoSquared Analytics. Gain a deeper understanding of your Magento online store by installing GoSquared Analytics. See which of your HelpDocs support docs are being viewed most with our HelpDocs integration. Easily install GoSquared Analytics on your website without touching a line of code with our Ensighten integration. Display your GoSquared Analytics metrics alongside metrics from other tools using Geckoboard. Display your GoSquared Analytics metrics alongside metrics from other tools using Klipfolio.